Ratings are averaged based on 36 reviews. We upgraded to a pool access room which didn't disappoint. Superb. Buffet brekkie superb, large swim up bar with the best cocktails and great place to meet other travellers. Will definitely be gong back to Beyond Resort Kata for a longer stay next time! The swimming pool was far too warm and was not refreshing at all. This is my only complaint. Excellent service where the customer is made feel important. Great facilities, food and staff. Second trip and will return! Excellent location. Right on the beach. Hot water and clean rooms. Great location, right on the beach and opposite shops bars and restaurants. Loved the pool and swim up bar. Meal and cocktail prices ok, especially during happy hour. We had a meal and beverage discount voucher as part of our deal but no one advised that we needed to show it at every purchase which is a little hard with a cardboard card at the swim up bar! The rooms were clean and spacious. The buffet breakfasts were great but didnt have any of the buffet for dinner but they looked great, just a little more expensive than the local restaurants.Guests, even though requested not to by the resort, put their towels out the deck chairs around the pool early in the morning and often left them there all day without using them which is annoying. If you are planning to spend the day at the pool, get in early to reserve yourself a chair. Would definately stay again. Hotel was great, beach and pool was beautiful.. We had a room on 2nd floor and enjoyed the sun sets. Better off eating and drinking in the hotel as we struggled to find a good meal outside the hotel, got food poisoning twice in 2 weeks. Hotel food was good quality. Hotel is good overall. The buffet breakfast needs a solution from the birds and flies as it is open-air. Maybe the food could have been covered a bit better. The rooms were a bit dusty and dated, but nothing really major. We recently stayed at Kata Beach Resort & Spa for a girls trip and absolutely loved our stay ecspecially when booked on the Travelonline deal ..practically half price which was fantastic value. The Location is perfect.... plenty of eating options at your door step... we would eat breaky at the resort and walk up the beach or across the rd to fabulous restaurants each night. The resort is as others have mentioned slightly dated but not bad by any means.. clean large rooms, fabulous view from ocean view rooms, we would go back in a heart beat. Overall we think you can not beat the location..5 star all the way! Beautiful location, right on the beach. Great swimming beach. Easy access to local restaurants from the beach as well as across the road from the resort. Also lots of shopping across the road from the resort. What a wonderful place, situated near restaurants, markets and great service. Swimming pool area is divine, staff very friendly and helpful. Breakfast was included in our package and there was a huge amount of choice. Would come back again. Had a fabulous stay by the pool with a swim up bar and down the steps to Kata Beach. View is amazing every morning from my balcony. Room was cleaned daily and staff always say hello. Thoroughly recommend this resort as price, location and daily breakfast is awesome. What a great place for a holiday could not fault it , but don't tell anybody, we plan to go back and we want it to ourselves. 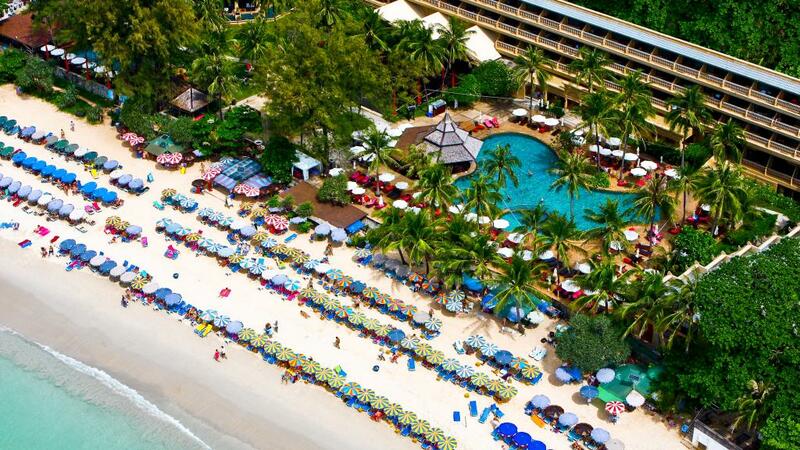 You don't get the hustle and bustle of Patong at Kata and it has everything you need. We stayed 12 nights between 27/04 and 09/05/2014 as family of four including 2 x teenage sons, our 2nd trip to Phuket, 1st stay at Kata Beach. Our reservations about our decision to use this resort in consideration of the negative reviews were allayed the moment we checked in. The lobby was bright & airy, staff were efficient on checkin & courteous at all times, if you greet them and smile so will they ! Our request to have buffet breakfast upon arrival was not a problem, we were also given the use of a room and all facilities for the first day without charge as we checked in 8.30am, this was offered without request & sincerely appreciated. Location, Location, Location - what can you say, magic beach one side, beautiful clean pool/gardens in the middle, all the restaurants, cafes, mini marts, taxis/tuk tuks & shops you could want within easy walk, all open till at least 11pm every day & without the constant badgering of Patong - much more laid back. The bar across the road with the waverider was a great hit with my boys. The buffet breakfast was great with something for everybody, room service good value, the pool bar great for coffee, drinks, snacks & light lunches, buffet meals good but get there early as replenishment stops quite early. Before going I read some troubling reviews about this hotel, but we had a wonderful stay. The location is just wonderful, and we had a really positive experience. The only downside was that on the last day of our stay the beach was really dirty, but we can't blame the hotel for this. In that instance the hotel pool was the saviour. The rooms were huge, the food plentiful, the service wonderful. We would stay here again. Kata Beach. It is quite large and spacious with plenty of things to do there. Andrew, general manager, knows how to communicate with people , great resort , beautiful location , highly recommended, for people who love the surf, n having fun! Fantastic stay. The staff were helpful and polite, and the buffet breakfast each morning was delicious. Wonderful stay - Great Pools!! Our stay for 10 days at the Kata Beach Resort and Spa was fantastic. The area of Kata Beach is much less crowded and noisy than Patong or Karon Beach, but with a beautiful beach and many places to eat of all prices and cuisines. The stretch of beach was much nicer than Karon or Patong, and there were plenty of lovely beauty parlours for fantastic Thai massages, and it was also still close enough to get around to local attractions. We will definitely recommend this hotel, and are planning to go back in the future with our children. Loved the room that had our own pool off the balcony. The main pool was emptied on the last day we were there for renovation but as we had our own pool we were fine for swimming. We were extremely lucky to be upgraded to a Grand suite for our 8 nts but were surprised at the lack of music or dvd player in the room. Suggest music at the pool area and breakfast area to add a little holiday atmosphere. We found the in room dining Thai food disappointing but the International food good quality. Otherwise a wonderful Hotel and amazing views! Kata Beach Resort is in an excellent location, we were well looked after by staff, and thoroughly enjoyed our time away. A very helpful resource is the tour agency located within the Hotel. A great place to have a family holiday. A place where you can truly unwind and feel safe. The position of the hotel is right on the water with shops and restaurants across the road what more could one ask for? ?